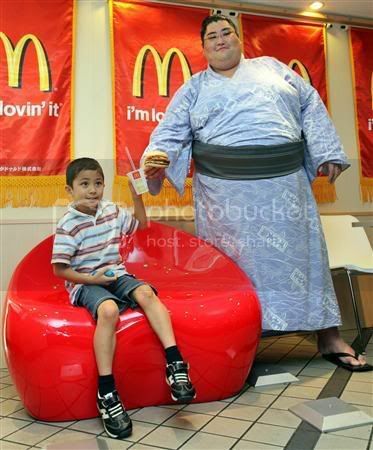 The look on this kid's eyes only confirms the stroke of PR genius this tie-in obviously inspires. But, really what are the chances this kind of relationship would fly in America? If Kraft's Cheddar Explosion drew the ire of health experts and calorie counts are showing up on menus, imagine the PR Kinjite such sponsorship would inspire. In reality, anti-obesity activists may have more to gain than lose. Is there a sports sponsorship that would seemingly better demonstrate the dangerous ties between junk food and weight gain? 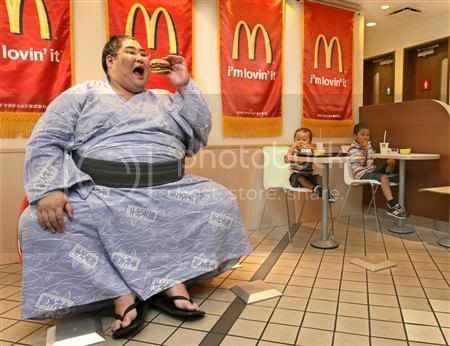 Nevertheless, McDonald's surely gets some affinity from sponsoring one of Japan's most beloved pastimes. And in case you're wondering how much a Sumo sponsor might have to fork out to get involved, according to Wikipedia, the winner of top Sumo bouts typically receive around 30,000 yen net per sponsor (out of the sponsors contribution of 60,000 yen/$650).